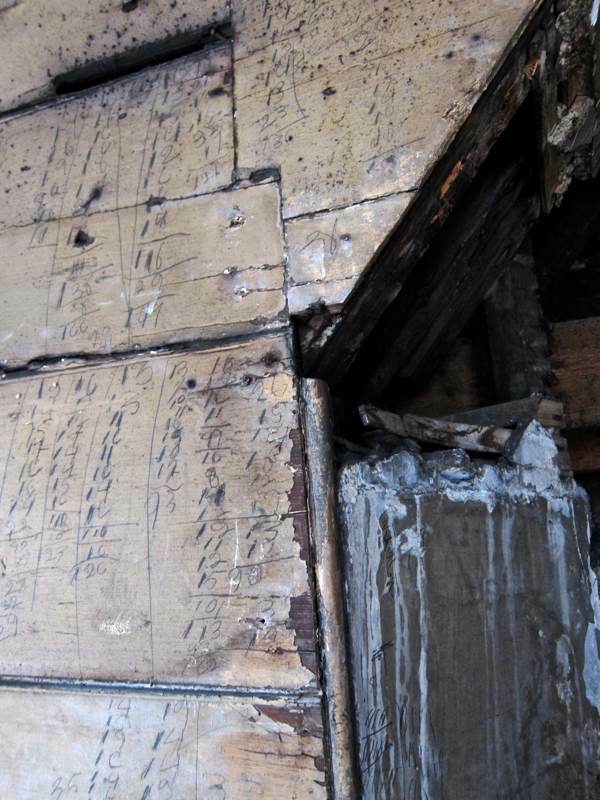 This graffiti was uncovered recently in the garret on top of an eighteenth century house on the corner of Elder St. In an irregular room that has the atmosphere of a cabin in a twisted old ship, with windows on two sides admitting maximum light for weaving or tailoring, walls slant upwards under the eaves to converge at the ridge, lined with old match-boarding once painted in white paint, now yellowed and peeling. When the place was converted for offices in the last century, plasterboard was put up to cover – and consequently protect – the old match-boarding which dates from the time this space was used for manufacture. 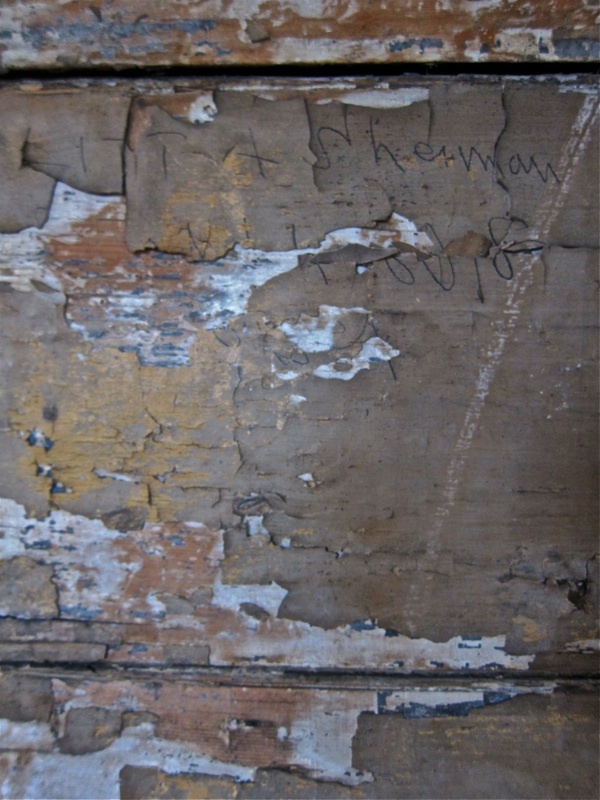 On my first visit, half the plasterboard still remained creating a dramatic contrast between the bland surface of the former office wall and the rich multi-layered texture of the match-board behind that carried the human presence in its wear and, most importantly, in its graffiti. 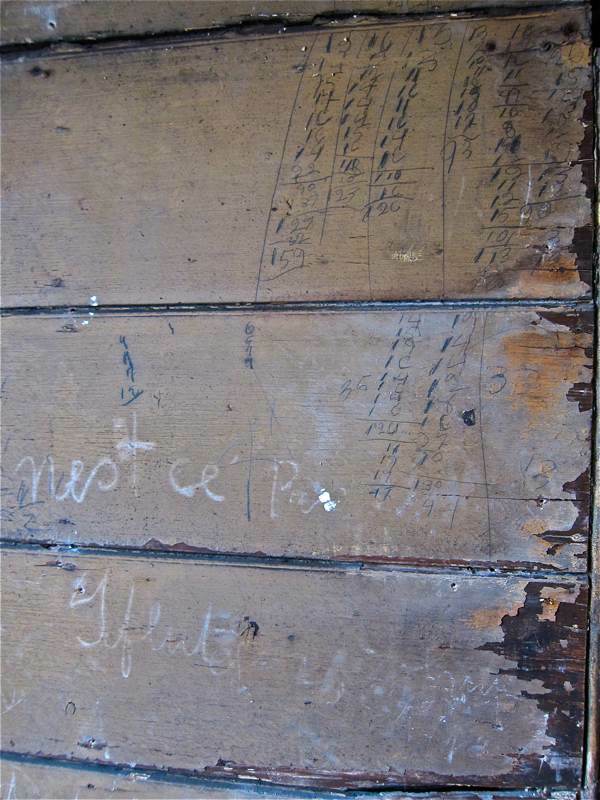 There was a time when such evidence of previous occupants would be conscientiously removed but I am glad to report that the new owner of this house was delighted to discover these marks, evidencing those who came before, and invited me inside to photograph them. 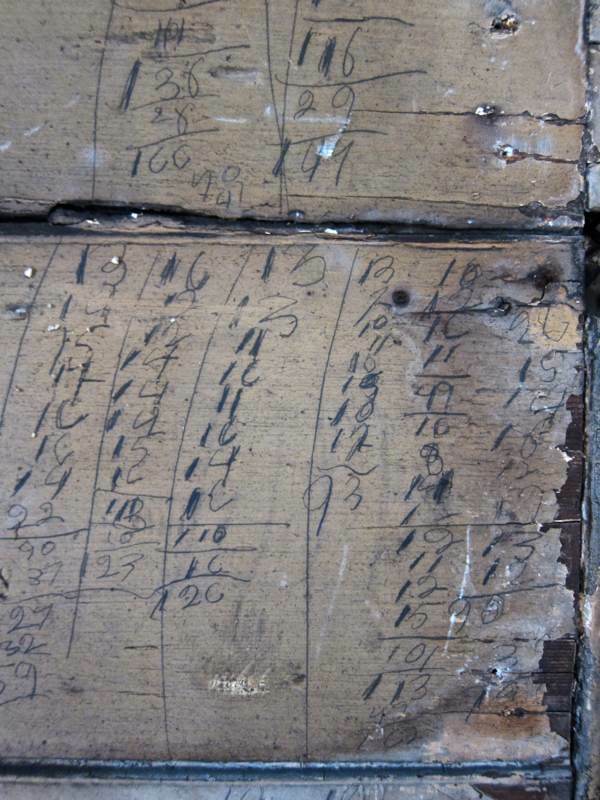 Columns of numbers, scribbled hastily in pencil, record calculations that are sometimes in eights – but whether these refer to piecework or hours of labour, I could not tell. 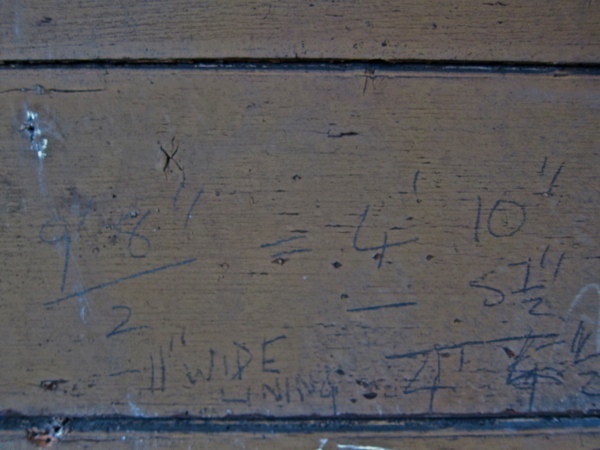 To the left in a different script, a reference to “11″ wide lining” appears to be a calculation of the amount of fabric needed to line a coat. Beneath these is a French phrase in chalk which begins “N’est ce pas” followed by a word I did not recognise, but whether this indicates the presence of a French speaker or merely a French lesson, we shall never know. It does seem that a child took the same piece of chalk to draw a zig zag along the wall, which might suggest that the phrase might be part of a lesson. There are two signatures – A.M.B. 3/8/93 and LITTA SHERMAN with illegible numbers beneath. 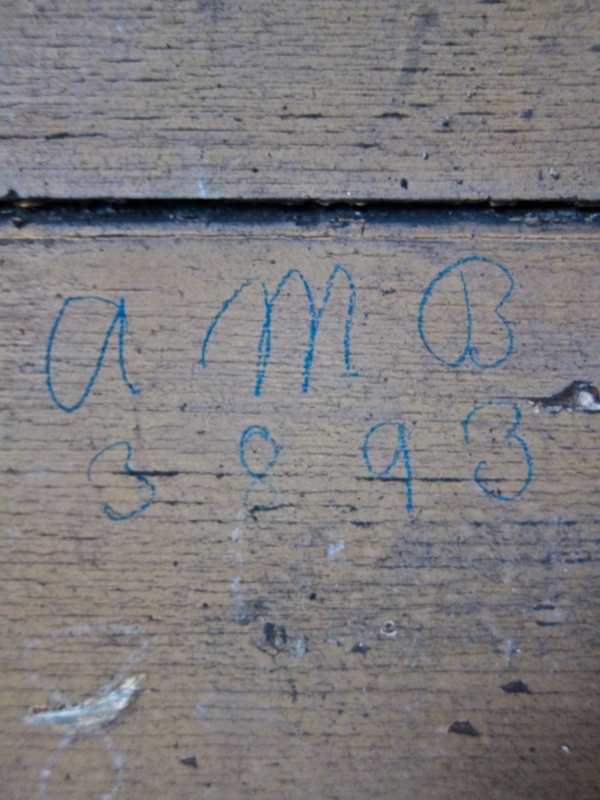 Since these walls have been covered for decades we can assume that A.M.B. 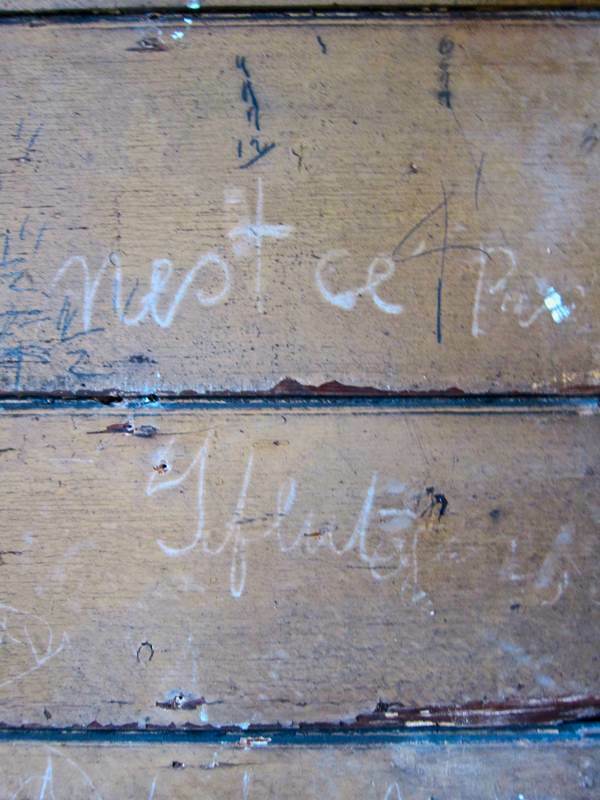 was here in August 1893, which leads me to surmise this graffiti originates from a late-nineteenth century garret clothing workshop, inhabited by a family. 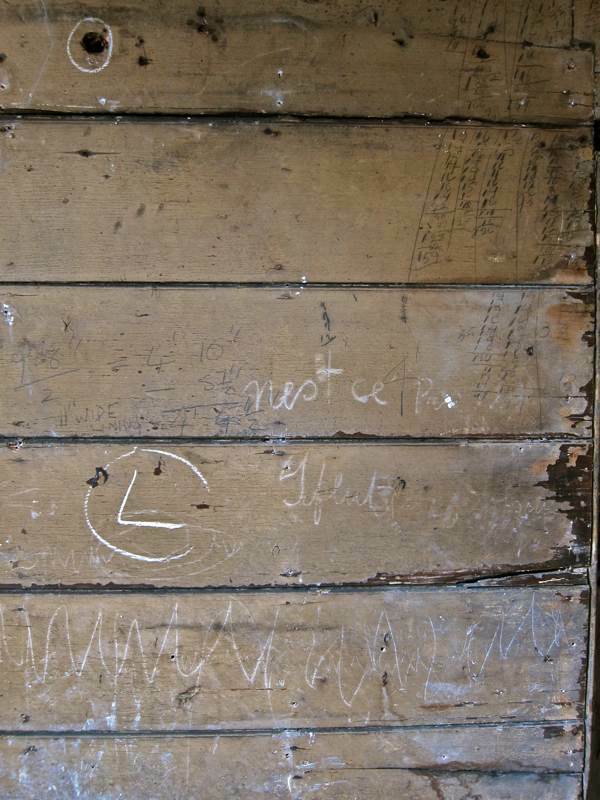 Children scrawling on the walls lower down and the parents tallying their work higher up. The only identity we have is Litta Sherman, a characterful name which carries its own personality, and was likely Jewish. This graffiti feels familiar. You might see a similar form today where numbers are written around a phone at a taxi rank, or where a tally is kept on a factory or warehouse wall. There is an intimacy in such fragile pencil marks and an emotionalism in these columns of overworked digits scaling up towards the ceiling, witnessing endless labour. They speak of the time when Spitalfields was entirely given over to textile manufacturing and workers strived long hours in cramped workshops, suffering at the caprices of a volatile industry. Now, these poignant scribbles are the only evidence of those who are long gone, and they speak to me – and make me wish I could find out who Litta Sherman was. A long time ago, a child took a piece of chalk and drew a zig-zag line. Does “11″ wide lining” refer to the cloth for a coat? Do these calculations refer to piecework, or hours worked, or something else? Who was Litta Sherman? Tantalisingly, the numbers beneath have been partly erased. I had a quick look on Ancestry. She may have been Letitia Sherman 1777- 1854. She was born in Shoreditch and married Thomas Holmes. Their son William was a Cabinet maker in Shoreditch. This may provide a clue. I think the inscription below ‘Litta Sherman” may be cursive Hebrew script (writen right to left). The letter on the far right seems to be a ‘lamed’ (=L); the second from the right may be a final ‘chaf’ (= ch), although it is not clear (may possibly be a final ‘mem’ (=M). If the former it would spell the short word ‘lechah’ or ‘Lach’, which means (masculine or femine) “to you”. The third letter from the right seems to be a ‘shin’ (=sh). Can’t make out any more. Incidently — also not clear from the photo whether the ‘L’ in Litta is actually drawn, or is just a crack in the plaster. If the latter, the word would read ‘Itta’, which is a recognisable Yiddish familiar name. I have never heard the name ‘Litta’, although it may well be a nickname for ‘Letitia’ (see previous comment). For what it’s worth,’Litta’ (more usually transliterated as ‘Lita’) is also the Hebrew/Yiddish name for Lithuania. N’est ce pas means ‘it isn’t’ (roughly) and I think ifluter is a yiddish/germanic word meaning ‘nothing’ (perhaps!). Crikey! The things you learn on this blog…. I was looking for Thomas Holmes – my ancestor- and once again found your brilliant website. The Letitia Shearman (first comment) was actually born in Potton, Bedfordshire and was called ‘Lettice’ Shearman, Born 1774. Father Joseph. But whether relevant to your blog – no idea. thanks for comments.